Nada the Papillon / Chihuahua mix (Chion) at 1 year and 2 months old and weighing 4.409 pounds (2 kg)—her owners refer to her as a Papihuahua. Nada is from New Zealand. The Chion is not a purebred dog. It is a cross between the Chihuahua and the Papillon. The best way to determine the temperament of a mixed breed is to look up all breeds in the cross and know you can get any combination of any of the characteristics found in either breed. Not all of these designer hybrid dogs being bred are 50% purebred to 50% purebred. It is very common for breeders to breed multi-generation crosses. 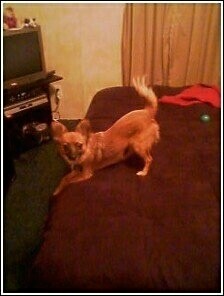 Taco the Chion (Chihuahua / Papillon mix breed dog) at 11 months old and a whopping 6 lbs. "He loves to be called "Mommy's good Chihuahua" and will howl for you if you say that to him, but will turn away if you call him a good Papillon. He's great with the kids, cats and our other dog. Taco was a rescue from our local shelter so I think that makes him much more appreciative. He just recently got registered as a Therapy Dog and is going to start visiting the local hospitals and nursing homes." Max the F1b Chion puppy at 17 weeks old (Papillon / Chihuahua mix)—"His Mommy is a Papillon and his Daddy is a Chion (Chihuahua / Papillon mix). His owners nicknamed him "Mad" Max because he goes nonstop and thinks he's a big dog."